Margo Anton's Mosaic a Day: "Dichotomy"
The new marble order I received from Italy has some amazing colors in it that I haven't gotten to play with before. 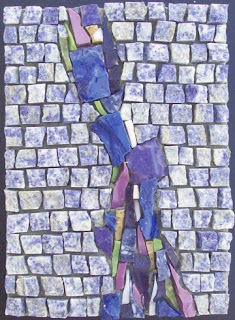 For this piece I used some of it for the background, but then used scraps from previous projects for the "break through" section in the middle. I think it really shows the two sides of my own journey in mosaic. In the beginning I was trying to make everything look perfect, and now I'm trying to unlearn perfect to become more expressive, more artistic.